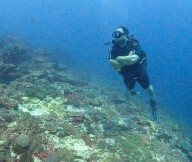 This scuba diving trip in Bali is ideal for certified divers looking for a quick chance to explore the Bali Sea floor. 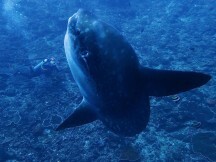 On this trip, you’ll undertake 2 open water dives of 45 minutes each. Depending on your prior level of certification, these dives will take you to depths from 30 to 100 feet. Once you take the plunge into the clear, blue-green waters of the Bali Sea, you’ll swim among the vibrant corals that are home to various species of brightly coloured fishes. You’ll explore the striking underwater topography of the Bali Sea that feature coral walls, sandy floors and coral bommies. Please note that only divers certified as SSI/PADI Open Water Diver or higher are allowed to book this course. Your dive centre is located near the Jungutbatu village of Nusa Lembongan, one of the best places for scuba diving in Bali. Your scuba course can offer you a variety of underwater experiences due to the multiple dive spots located all around the Nusa Islands. These dive spots in the tropical waters of the Bali Sea offer a lively and sandy bottom that is scattered with small fishes like frog fish, moral eels, lobsters, damselfish and several other small, brightly-coloured species. When you’re not diving, you can also explore Bali’s beautiful beaches lined with palm trees and lush greenery. • Explore the Bali Sea floor on this fun scuba dive in Bali. • Undertake 2 open water dives as deep as 30 to 100 feet for 45 minutes each. • Explore the incredible marine life of the Bali Sea. Divers are required to adhere to the instructions of the dive instructor during this scuba diving trip in Bali. Please allow a minimum of 12 hours between the end of your trip and your return flight to allow your body to recover. Divers are requested to treat the local culture with respect and avoid littering, defacing property or equipment, harming marine life and causing general disturbance. For cancellations made less than 7 days before departure of the scuba diving trip in Bali: No refund. For cancellations made 7-14 days before departure of the scuba diving trip in Bali: 50% refund. For cancellations made more than 14 days before departure of the scuba diving trip in Bali: Full refund. Divers are required to complete a medical statement that will be sent after booking confirmation. The tour operator reserves the right to change or cancel the itinerary of this scuba diving trip in Bali due to bad weather conditions or other unforeseen circumstances to ensure maximum safety of divers and staff. Arrive at the dive centre in Nusa Lembongan by 07:00 hrs. After a quick briefing with a certified instructor, you'll board the a ferry/boat that will take you to the many dive spots around the Nusa Islands for two amazing dives. Depending on your level of prior certification, you can dive as deep as 30 to 100 feet. A certified diving instructor will accompany you during your 45-min dives. After exploring Bali's rich aquatic world, you'll return back to the Lembongan dive centre. Your trip ends here. Spot exotic marine life like sea turtles. Any costs arising due to unforeseen circumstances such as bad weather, road blocks etc. • Specific/personal medication, personal first-aid kit. No accommodation is provided throughout the trip. You'll be provided with a light, packed lunch with tea/coffee and snacks served during the ferry/boat transfer to the dive spots. Bali is well-connected to most major cities of the world via flights to Ngurah Rai International Airport (DPS). You can take a ferry/boat-ride from Bali to reach Nusa Lembongan.